One of the most prominent and urgent problems in international governance is how the different branches and norms of international law interact and what to do in the event of conflict. With no single 'international legislator' and a multitude of states, international organisations and tribunals making and enforcing the law, the international legal system is decentralised. This leads to a wide variety of international norms, ranging from customary international law and general principles of law, to multilateral and bilateral treaties on trade, the environment, human rights, the law of the sea, etc. Pauwelyn provides a framework on how these different norms interact, focusing on the relationship between the law of the World Trade Organisation (WTO) and other rules of international law. 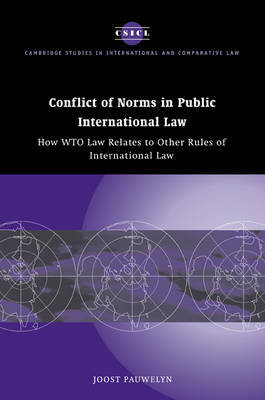 He also examines the hierarchy of norms within the WTO treaty. His recurring theme is how to marry trade and non-trade rules, or economic and non-economic objectives at the international level. Joost Pauewlyn is Associate Professor of Law at Duke University School of Law.